This book attempts to unpack the gift of prophecy providing practical tools in the area of supernatural hearing, seeing, and speaking. The evangelical and charismatic world is increasingly encouraging its members to prophesy and many emerging prophets are apperearing. Some churches are frightened of the gift while others have experienced great benefit. Many individuals are desprate to grow in their gift but unsure how. This book attempts to practically unpack this gift - dealing with some of the common problems that crop up - and to help with practical tools in the world of supernatural hearing, seeing, and speaking. 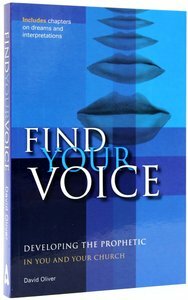 - Publisher This book unpacks the gift of prophecy providing practical tools in the area of supernatural hearing, seeing, and speaking.The evangelical and charismatic world is increasingly encouraging its members to prophesy and many prophets are emerging. Some churches are frightened of the gift, while others have experienced great benefit. Many individuals are desperate to grow in their gift but are unsure how. This book unpacks this gift, dealing with some of the common problems that crop up. It is a book for those who want to develop the prophetic, church leaders and the church as a whole. This book unpacks the gift of prophecy providing practical tools in the area of supernatural hearing, seeing, and speaking.The evangelical and charismatic world is increasingly encouraging its members to prophesy and many prophets are emerging. Some churches are frightened of the gift, while others have experienced great benefit. Many individuals are desperate to grow in their gift but are unsure how. This book unpacks this gift, dealing with some of the common problems that crop up. It is a book for those who want to develop the prophetic, church leaders and the church as a whole. David Oliver is Managing Director of Insight Marketing and Associate Director of the Marketing Guild. He runs seminars around the world on negotiation, professional selling skills, and practical marketing.